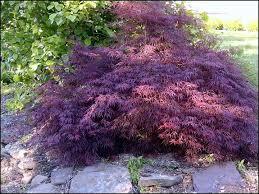 Tamukeyama Japanese Maple tree 2-3'. Acer palmatum dissectum 'Tamukeyama'. Hardy zones 5-8, 7-10' high, 8-15' spread mature. One of the fastest growing of the cutleaf, or laceleaf varieties. Heat resistance to southern climates. Great red to burgundy coloring, turns firey red in fall. Beautifully cascading form, award winner. Will ship semi bare root, unable to ship to CA, AZ, OR, WA, UT, NV, ID, HI, or AK.